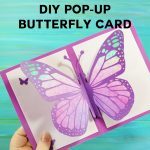 Your Cricut does a lot right out of the box, but it can do so much more! 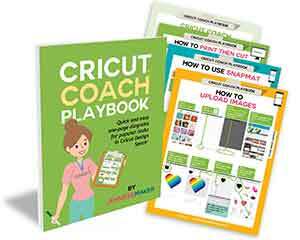 This is my personal collection of Cricut tips and tricks I’ve collected that have really helped me realize the amazing potential of this machine. I recommend you print this out and keep it near your Cricut so you can refer to it whenever necessary! If your material isn’t sticking to the mat well enough, tape down the edges with blue painter’s tape or masking tape. 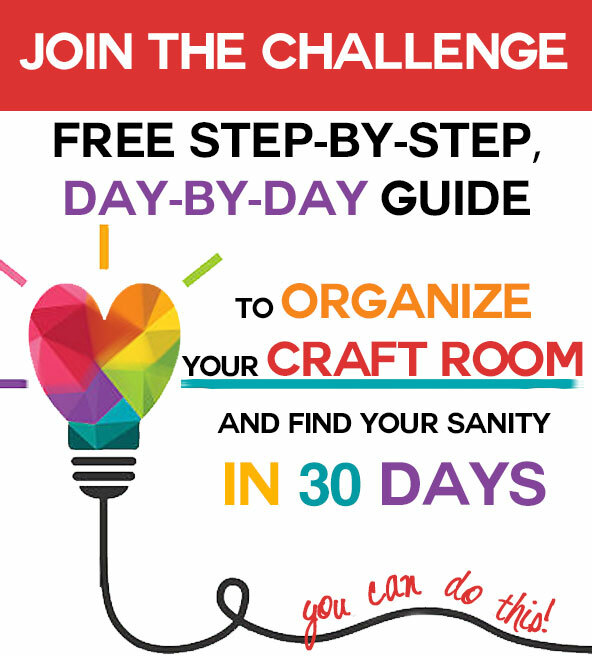 If you have a project that calls for cuts on two different materials (for example, green cardstock and red cardstock), you can do the cuts at the same time. 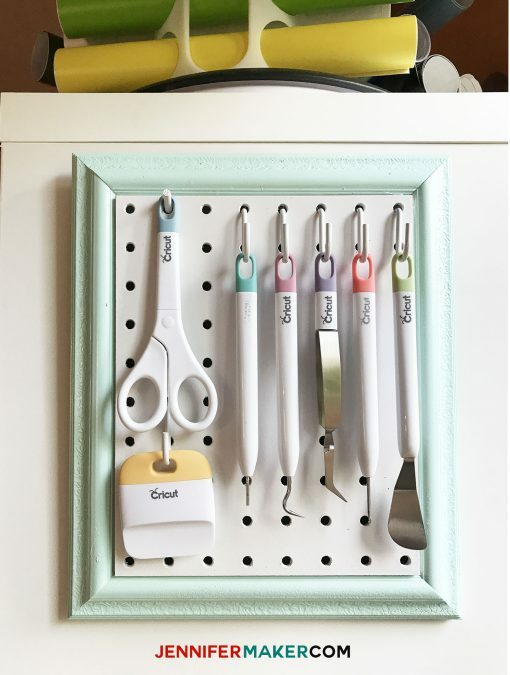 Just position the designs you’ll be cutting in different areas of the canvas in Cricut Design Space, select all, click Attach, and then position your materials in those same spots on your mat. Always test your cuts on scrap material before using your expensive, fancy, once-of-a-kind material. It will save you money and headache! 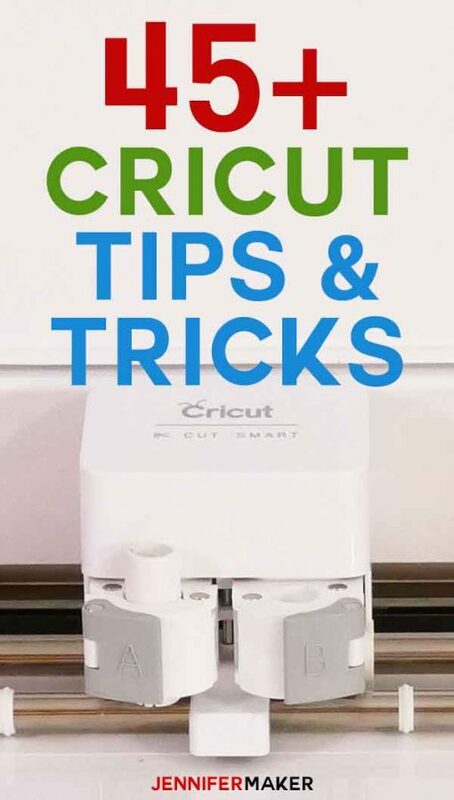 If you’re cutting a particularly difficult or thick material, your Cricut will probably cut it several times. What if that’s not enough to cut all the way through? Cut it again! Keep the mat in position (don’t press the arrows button to eject it) and press the “C” (Go) button again—it will cut it again! When you do print and cut, use an inkjet printer. It seems to work much better than a laser printer. The calibration light used in the machine to pick up the registration marks can heat the toner and cause it not to read by the machine. I use an HP inkjet printer, which works really well for print and cut. If you want to use print and cut on anything other than white paper, Cricut probably won’t be able to read the registration marks. So instead print out registration marks on white paper, cut them out, and tape them over your non-white paper before you put it in your Cricut! Or cut out these registration marks on sticker paper and put them over the marks on your colored paper. Like to write with the Cricut pens but don’t like the cost? 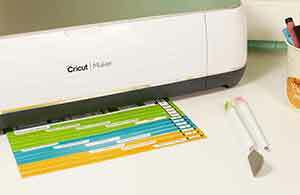 Try using Bic Round Stic Ballpoint Pens, Crayola Fine-Line Markers, Gelly Roll Metallic Gel Pens, or American Craft Slick Writers—they fit perfectly in your Cricut’s pen holder. Having issues placing your non-Cricut pen into the right position for writing? Place a craft stick under clamp A as you insert your pen, stopping just as the pen kisses the craft stick. Close the clamp, pull out your craft stick, and your pen will be in the perfect position. If you want to use another pen but it’s too thin, try putting tape around the barrel until it fits snugly. I like to use electrical tape. If you need free fonts that write as a single line, try Always Forever, DK Lampion, LiveLaughLove, Avenir Condensed Hand, or baby lexi – skinny font. All are available at http://www.dafont.com. To learn more about writing with your Cricut, check out my full Cricut Writing and Pen Tutorial. 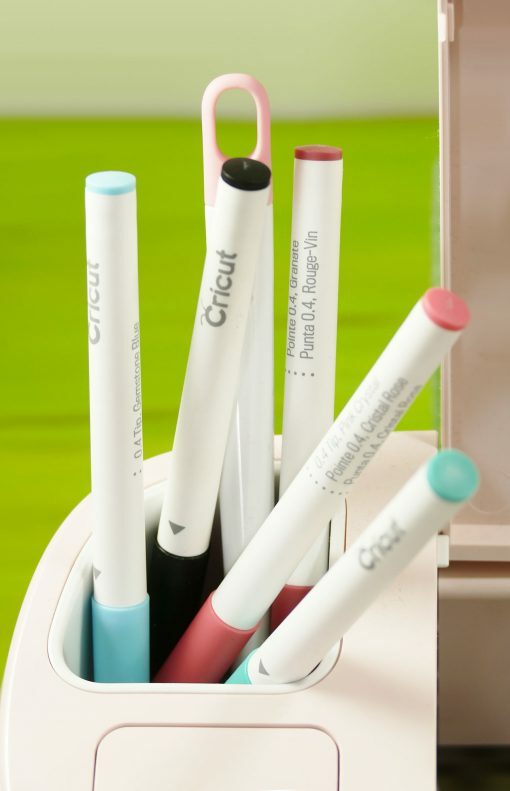 Store your pens cap down in your built-in accessory cup — that way your ink stays near the tip, ready to use when you are! You can purchase a separate scoring stylus and put it in the pen holder to score materials. Scoring makes for easier folding usually. If you want to use your Cricut to emboss, get an accessory adapter, replace your blade housing with this adapter, insert your scoring stylus, and tell Cricut Design Space to cut. It will emboss instead! You’ll get the best results if you put something with a little give under the material you want to emboss. Consider using a different blade to cut paper than the blade you use to cut vinyl—it will extend the life of the blade and make for sharper cuts. Color code your blades by painting the tip of the plastic blade cover with some acrylic paint—white for paper, black for vinyl, etc. If your blade isn’t cutting as well as it did, spread a piece of aluminum foil on your mat and cut a simple design in it. It will help sharpen your blade a bit. I do this and it works. 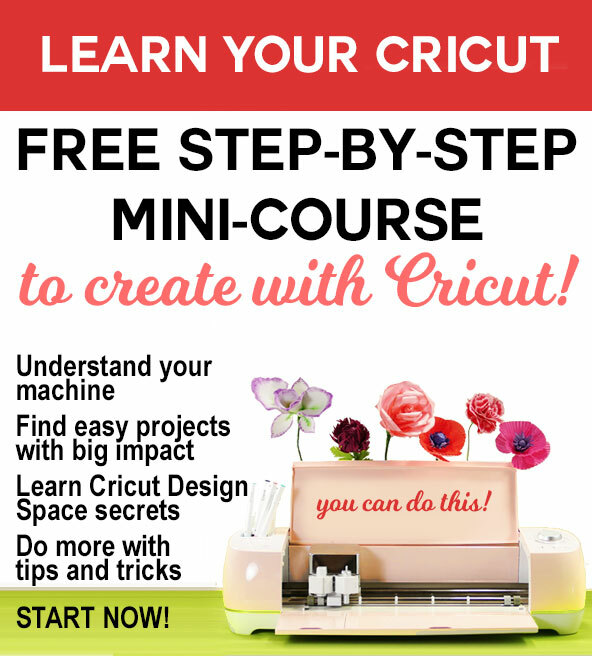 Cricut Design Space has free weekly designs! Note that they are only free for that one week, however — if you save them in a project and try to use them after the free week, you may be asked to pay for them. So use them or lose them! You don’t have to just use the fonts that are on your system or in Cricut Design Space—you can download new fonts, install them on your computer, and they’ll be accessible to use in Cricut Design Space (you’ll probably need to close and re-open Design Space to see them in the font list). My favorite places to find fonts are fontsquirrel.com and dafont.com. Consider installing dingbat and glyph fonts for easy access to pictures and icons! You can upload your own files to Cricut Design Space. The system accepts SVG, DXF, JPG, .BMP, GIF, and PNG files, but SVG and DXF will work best because they are vector-based. If SVG or DXF is not an option, use PNG for the best quality. If you are unfamiliar with how to find and upload SVG files, watch this helpful video training series I made. 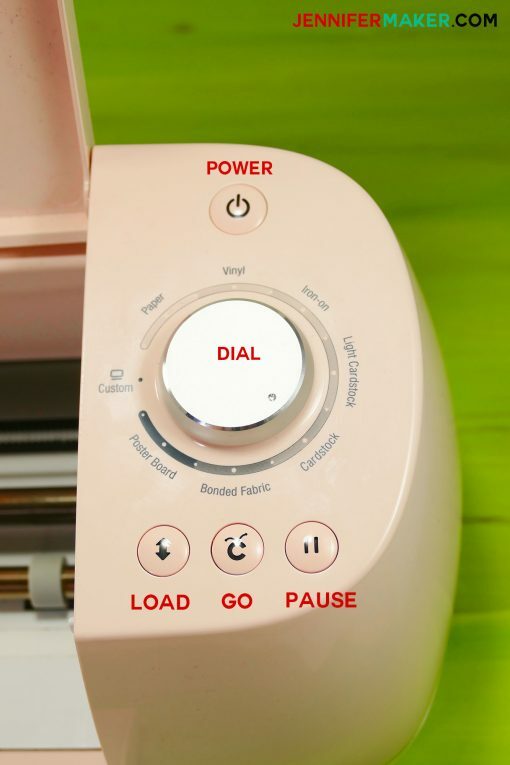 The “Attach” button in Cricut Design Space is my (and your) best friend. By selecting everything on the canvas and clicking “Attach,” the items on your canvas will stay in the exact spots you put them. Otherwise, Cricut will cut them out individually in the most economical way possible (which is nice, but not usually what we want). 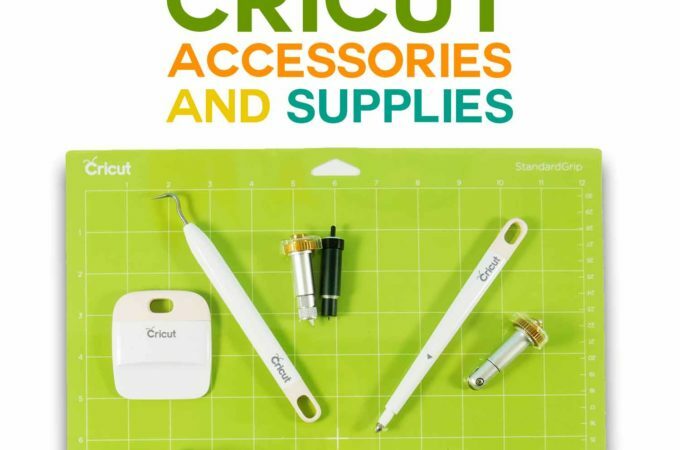 If you use Cricut Access and find a cool design, but you aren’t sure how to assemble it, there is a solution! Check the name of the cartridge that the design is from, then look it up in the Handbooks at https://home.cricut.com/handbooks — these handbooks offer assembly instructions! 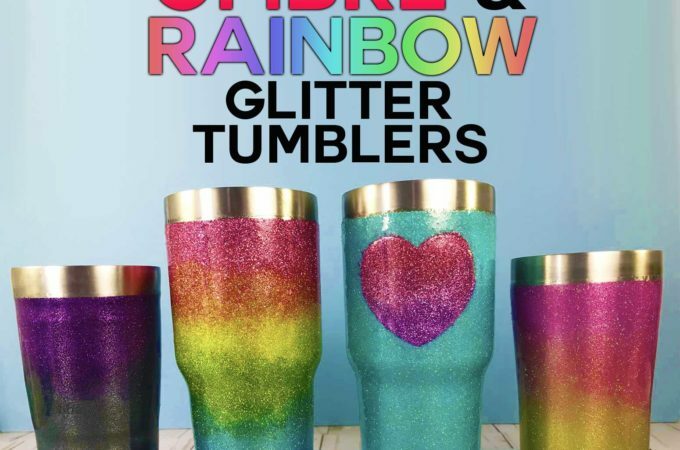 If you have issues using Cricut Design Space, try to avoid Google Chrome. The two don’t play together as nicely as Safari. Firefox also seems to work better. Pay attention to the layer order in Cricut Design Space, because your Cricut will cut from the bottom layer first and go from there. 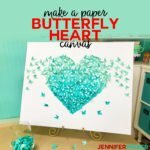 Thus, it’s a good idea to put any large outlines as the top layer so they are done last—this prevents your material from getting cut out and sliding around while your Cricut is still cutting the fine details. When it comes time to remove your finished project from the mat, flip your project over face down and peel the mat away from the material rather than try to remove the material from the mat. This keeps your material from getting curled in the removal process. If you have small bits stuck to the mat afterward, use an old plastic card (like a store loyalty card or expired credit card) to scrape them all quickly and easily. Keep mats cleaned is tough, especially if you live in a house with pets. 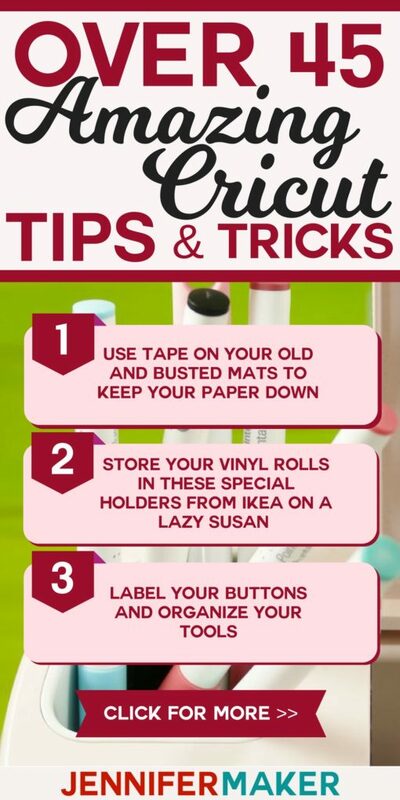 Keep a lint roller near your Cricut and use it on your mat after each job. Then put the protective plastic sheet back over the sticky side of the mat to prevent dust from falling on it. If your mat just isn’t sticky anymore, wash it with mild dish soap in warm water. I like to rub the dish soap (without lotion) all over the mat, in a circular motion, until it is covered. Rinse off and air dry. Another cure for a mat that’s lost it’s stick is to rub a Lysol/Clorox Bleach wipe or baby wipe across the surface. If you continue to have mats that don’t stick and aren’t worried about voiding your Cricut warranty (good for one year from purchase), you can try to apply a new sticky layer. 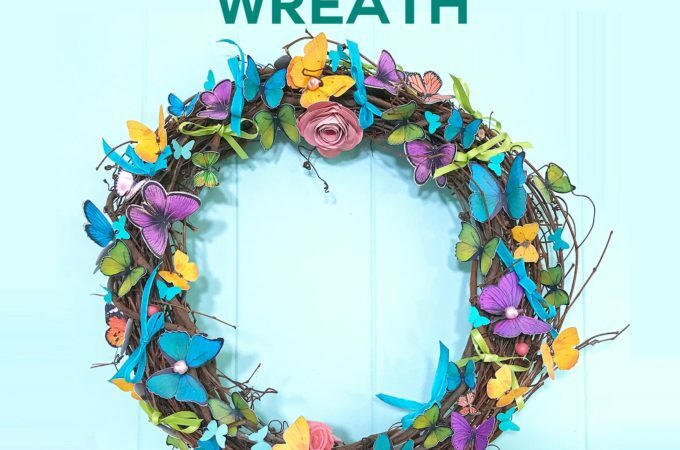 Things that other Cricut owners have tried include Zig 2 Way Glue Pen (chisel tip), photo spray adhesive, 3L E-Z Dots Repositionable Adhesive, KK100 temporary adhesive, or a mix of Aleene’s Tack-It Over and Over mixed with water (1:1 ratio). Just be aware that applying spray adhesive can cause an issue if you use too much (it gums up the rollers) and, of course, voids your Cricut warranty. 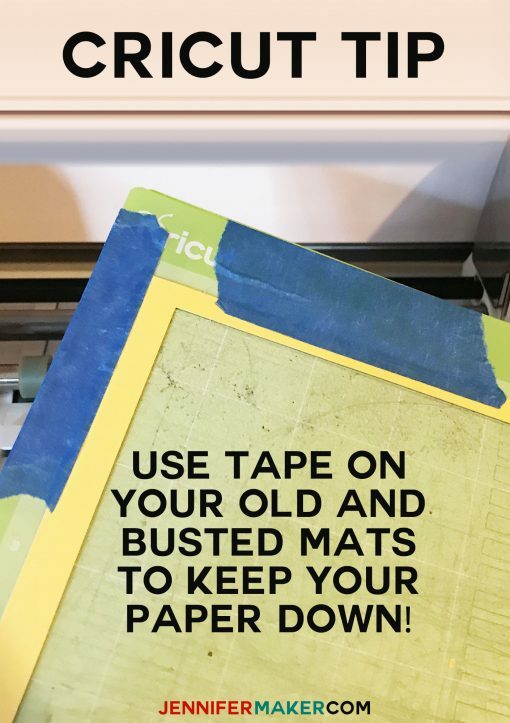 If you accidentally cut through your mat, fix it by placing duct tape or gorilla tape on the back of the mat. If you’re repeating the same cut over and over and wearing a cut path into your mat, turn your mat around and use the other side to save your mat some wear and tear. If you have to buy new mats, you can save money by getting the 12”x24” mats and cut them in half to 12”x12”. Buy your vinyl somewhere other than your local craft store for the best prices. I like to order from Amazon, but another great resource is your local sign shop. I stopped in mine the other day and they gave me a bunch of scraps for free. It doesn’t hurt to ask! 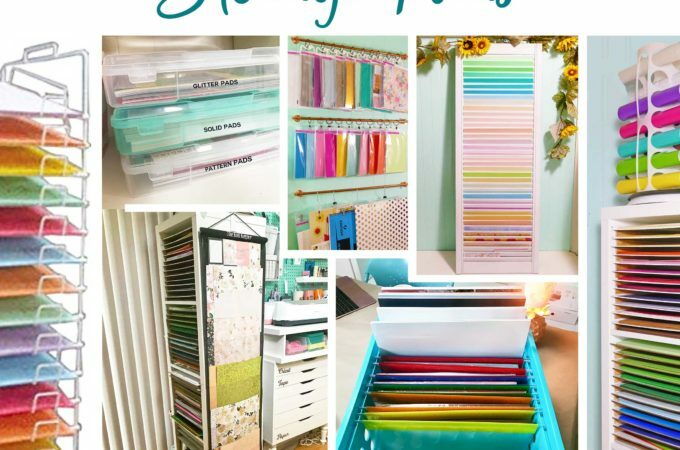 Don’t have a particular color of cardstock you really need? 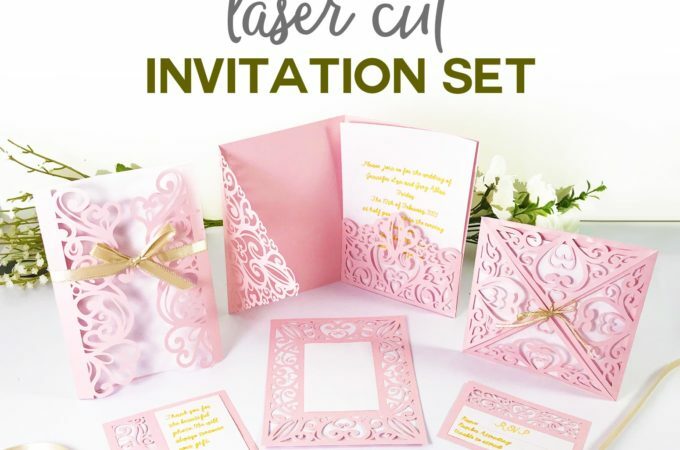 Try printing that exact color onto a piece of white cardstock before your cut it out! You can do something similar with vinyl using spray paint! Try Rustoleum Gloss or Metallics and be sure to let it dry completely before you cut it. Try using clear contact paper rather than the pricey transfer sheets to lift vinyl off the paper backing. I think it works better, too! 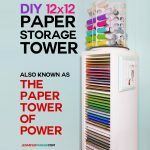 Tired of your rolls of vinyl coming loose and unwinding? Use paper towel or toilet paper cardboard rolls—just cut a long slit in the cardboard and place it over your vinyl roll. I store my vinyl in special organizers I got from IKEA. I have three of them on a 14″ lazy Susan — it works great!! Getting those tiny pieces of paper or vinyl out of a design can be difficult. Try a safety pin for the really small stuff. Dip your weeding tool in something tacky and use it to pick up the bits faster. I like to do my weeding in my lightbox, because it is so much brighter and easier to see the lines. If you don’t have a lightbox, try doing it next to a window on a sunny day or wear an LED headlamp. 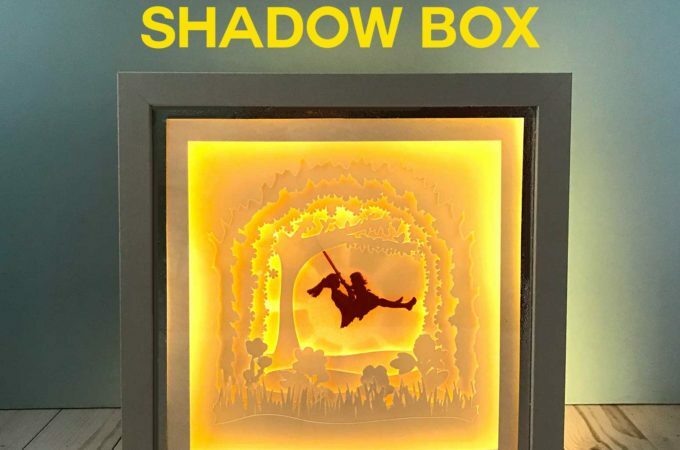 If you can afford it, buy a Cricut BrightPad or an LED lightbox from Amazon. Need a good font that weeds easily? Try Milkshake (free font from TheHungryJPEG.com). I am a big fan of 3M Tacky Glue or Aleene’s Tacky Glue for assembling my projects when I want a little leeway for positioning. But it does take time to dry. If you want a quicker adhesive, try Zip Dry Paper Glue by Beacon Adhesives—it’s a faster drying glue and very sticky! When you want a layer to pop out a bit from another layer, either use a product like Zots or Pop Dots (self adhesive foam mounts) or make little circles using cardboard or craft foam and glue it between your layers (that’s what I usually do). 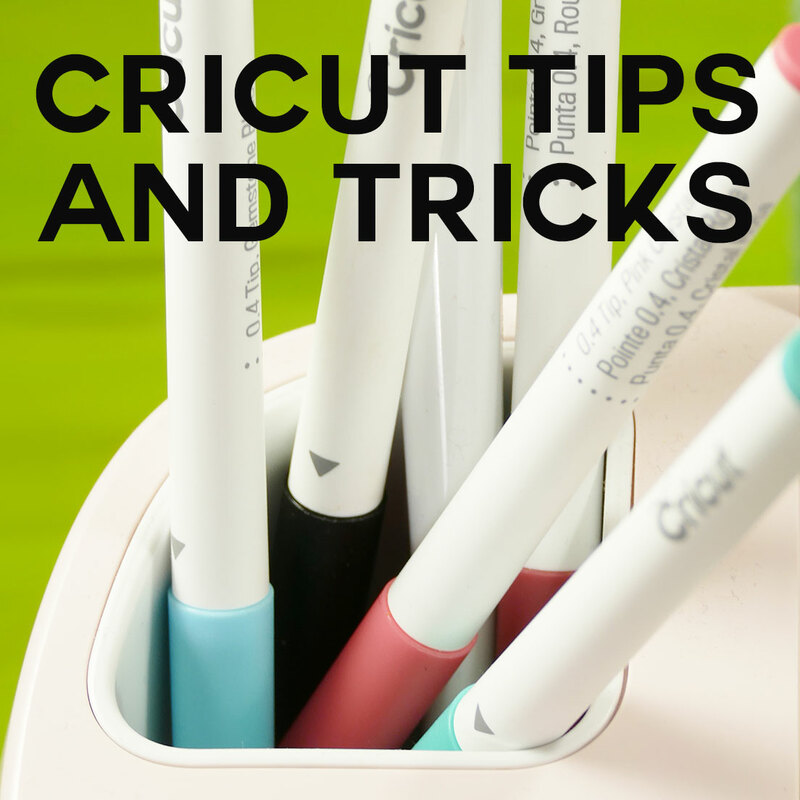 Do you have favorite Cricut tips and tricks you’d like to share with everyone? Post it here! I always love to hear from you! I will keep adding to this list, too. 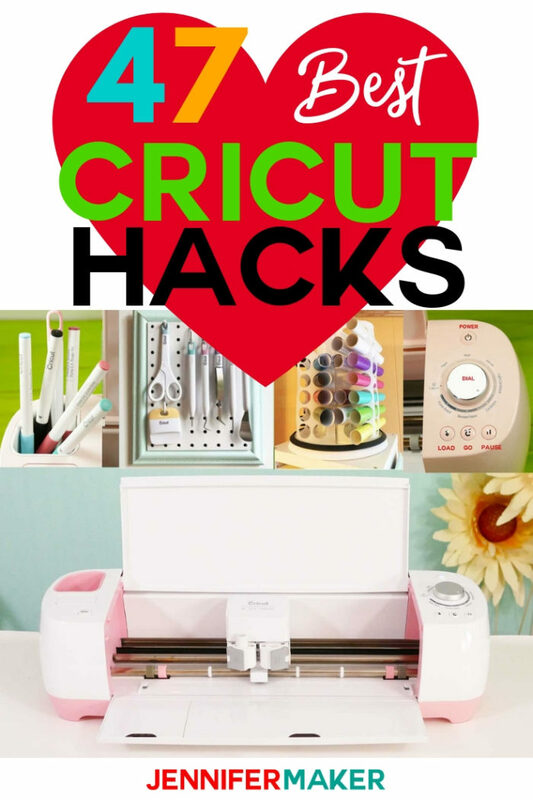 Want to remember this list of Cricut tips and tricks? 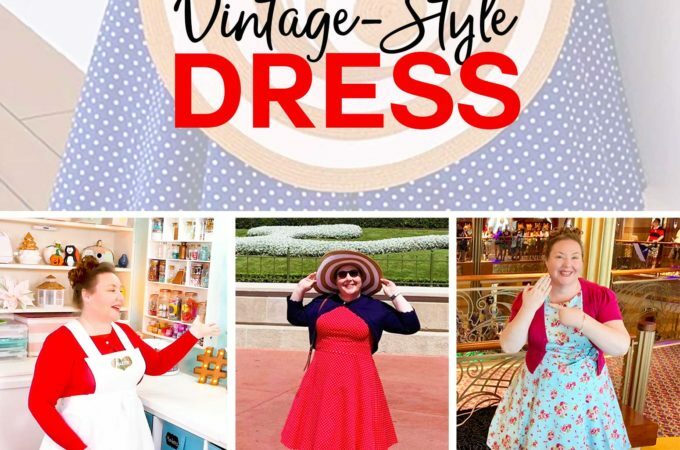 Pin it to your favorite Pinterest board! 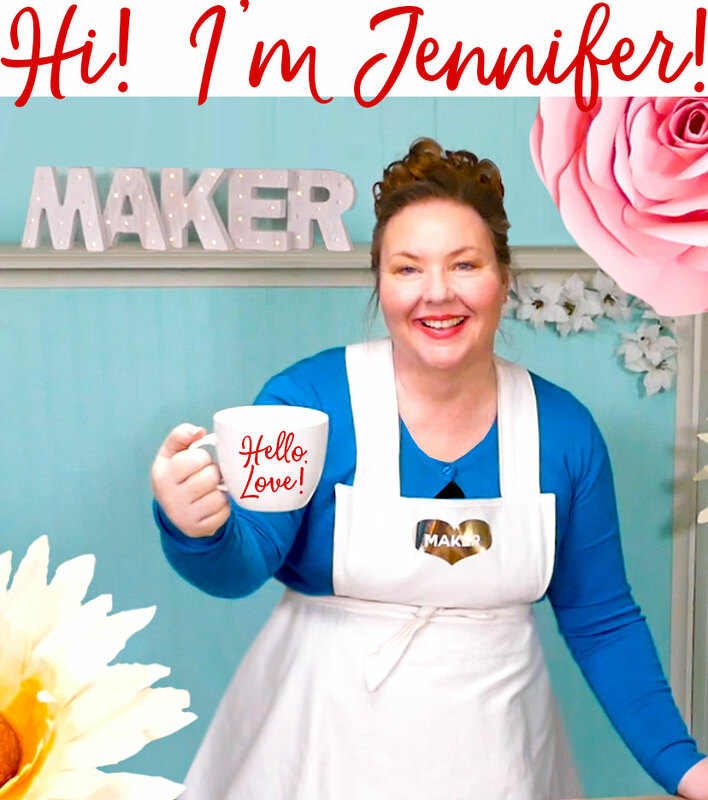 Wow, Jennifer, I’ve had my Cricut FOREVER and I was pretty sure you wouldn’t have any tips/tricks I didn’t already use – boy was I wrong! Thank you for so many excellent ideas! 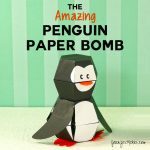 I LOVE your stuff, just uploaded the easy layer cards for something quick while I’m still working on making my own penguin bomb card – seriously the breadth of what you create just astounds me! In a world of a zillion emails a day yours is the first I read 🙂 Thank you! these are some great tips – thanks so much for sharing. 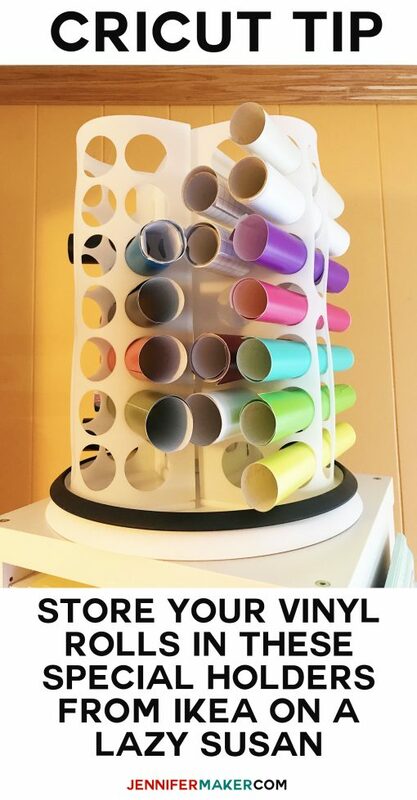 And I LOVE your ideas for storing vinyl and tools. Might be borrowing these! This post is filled with many gems. 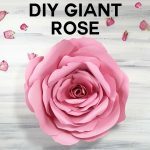 Some great tips which I thought I already had knowledge of, I was surprised. 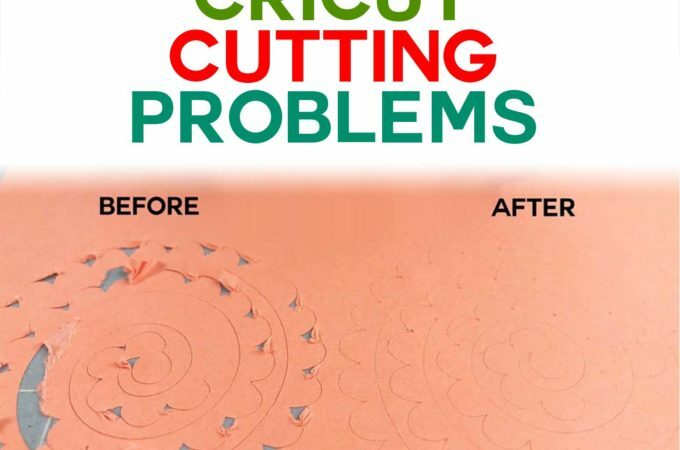 The Circuit is an amazing cutting machine with so much to offer. Great tips and tricks!! Thank you for sharing! 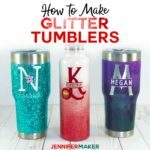 I am a newbie to the cricut world and these help me tremendously! I see you are from Ann Arbor, I am north of you in Mount Morris. Go Blue! The big house is my second home! ???? Thanks so much for the awesome tips. 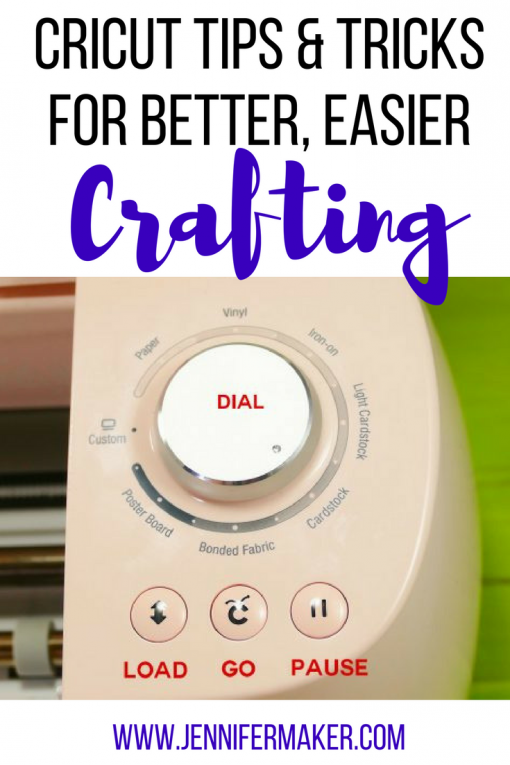 I love my cricut but have struggled with a few things but you have cleared those up. I purchased the pack of tools and figured out the purpose of them all except for the empty little doodad, yup the one that holds the scissors lol. Thanks for clearing that up with the photo. Thanks for the tips! That one about cutting the 12×24 mats in half, made me go, ” Why didn’t I think of that?”. Silly me! Fellow WoW gamer here! I played on a West coast server, Black Water Raiders. Thank you for sharing your great tips! If you’re cutting on a newer mat and don’t want to have to be super careful pulling off your finished image, first cut one out on a plain sheet and only peel off the excess paper, leaving your desired image on there. Then, place your nice paper, vinyl or whatever you’re using over it, making sure it sticks firmly. Then, put it back in to cut. When it’s finished, your project will just magically come off with no peeling! I just knew there had to be a better way than peeling every piece off, but I couldn’t find any tips online except to peel the mat off the paper instead of the paper from the mat. Thank you so much for giving us these tips. I am learning more and more about my cricut every day, and this was super helpful! Useful tips. Thank you for sharing.